We were starving after our flight so of course we had to eat on our way to Hana. We stopped at Café Mambo (apparently there's one in New York too) which was recommended by an acquaintance and a few friends. This place is in a little touristy part of Paia and had the coolest little shops and colored buildings. They're known for their orange glazed crispy duck so of course I had to try it! I had it on a bed of salad (I missed my greens!). This was so tasty and delicious! The duck was not gamey at all and not too chewy. It had a subtle sweet orange flavor to it that matched the greens well. My mom was craving jumbo shrimp in garlic butter after Oahu and she ordered their version of it here. These were also pretty tasty and with a good portion of shrimp to rice. 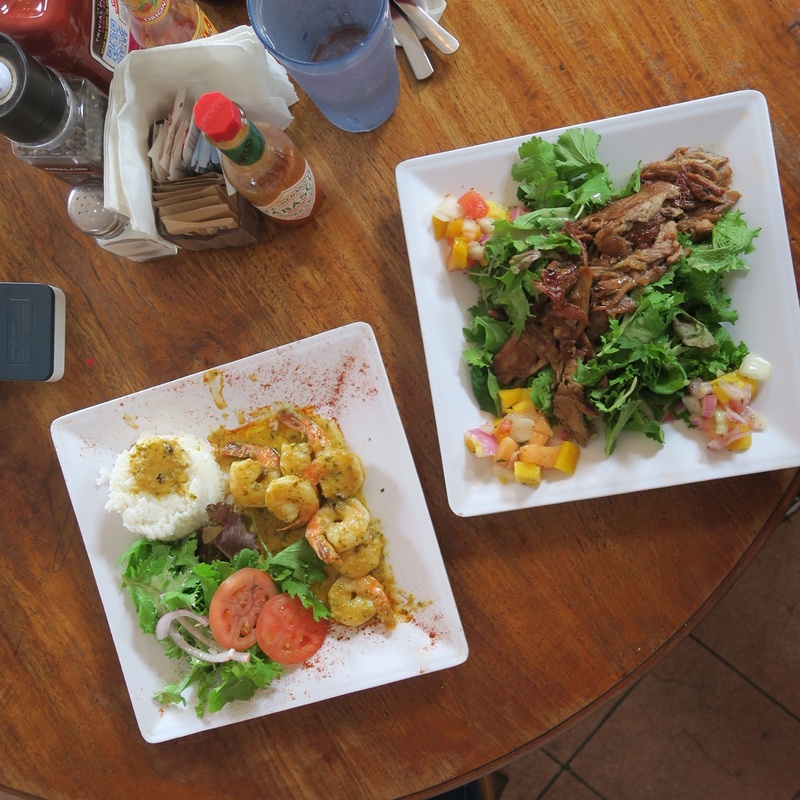 Definitely a good place to stop by if you're on your way to Hana (or back). Moving along to the east side, we finally reached Hana and not gonna lie, this place isn't for everyone, especially maybe not for a full 3 days. It is pretty remote with poor reception in most places and you better hope the place you are staying in has WiFi! For the majority of our meals, we made at the house we rented in from food we bought at Costco and Whole Foods (by the airport). Though, there are some good spots we found while we were here and the sites to see (beaches, trails, forests, etc.) are well worth the trip. 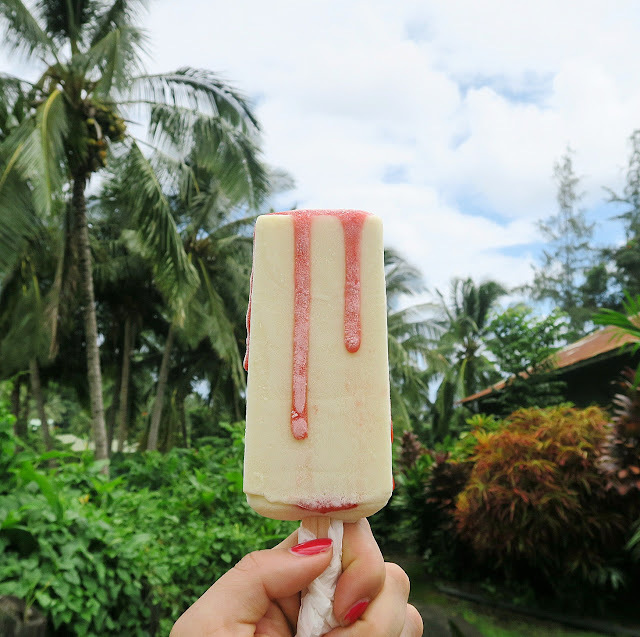 There's also a lot of little fruit stands, and food stops along the road in Hana but what caught my eye the most of course were these Shaka Pops! Fresh and handmade in Maui, the lady selling them on this hot, humid day with her mobile trike was super friendly and also recommended my the next stop to eat that was more local and not over priced. I had this Lava Flow which was a vegan pina colada with strawberry puree as the oozey lava. A must have whether you're in Hana or at a local grocery store that carries these. The main star of the place was Mr. Chow's food truck. 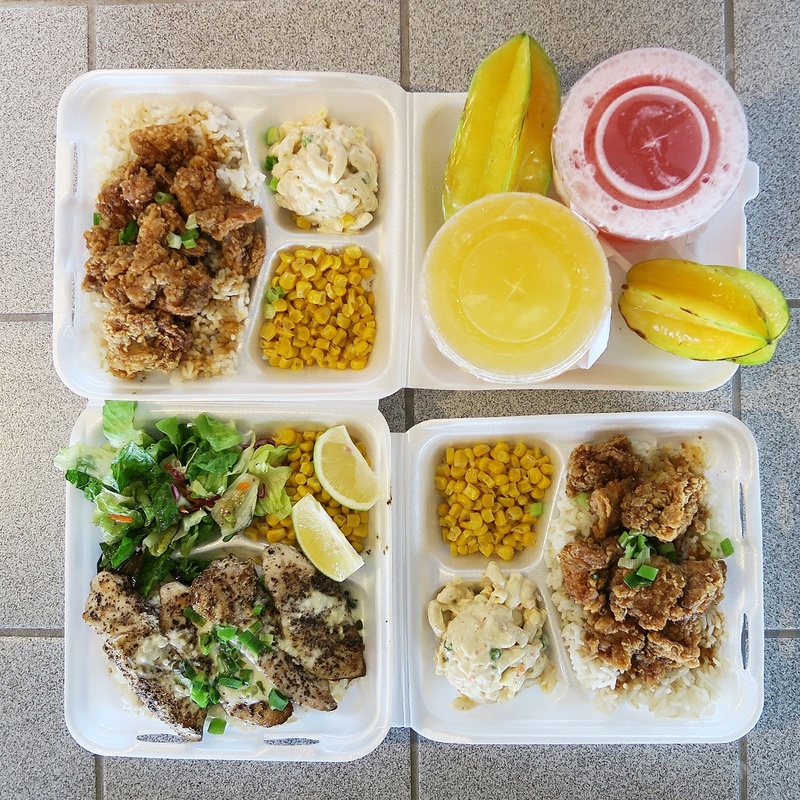 Located right in Hana (basically) he serves good portioned, home cooked Hawaiian dishes including a fresh catch fish, Loco Moco, and Korean Fried Chicken. We ended coming here twice since the other food truck was sold out and boy was I happy! The first day I had the Korean Fried Chicken and it was definitely better than Zippy's (sorry!). The chicken was more crisp and the sauce was tastier. His Mac Salad was also on point. My mom had the Mahi Mahi and it was done pretty well too with a nice grilled flavor, pepper seasonings and a citrus sauce on top. My aunt also had the KFC and my uncle had a burger. 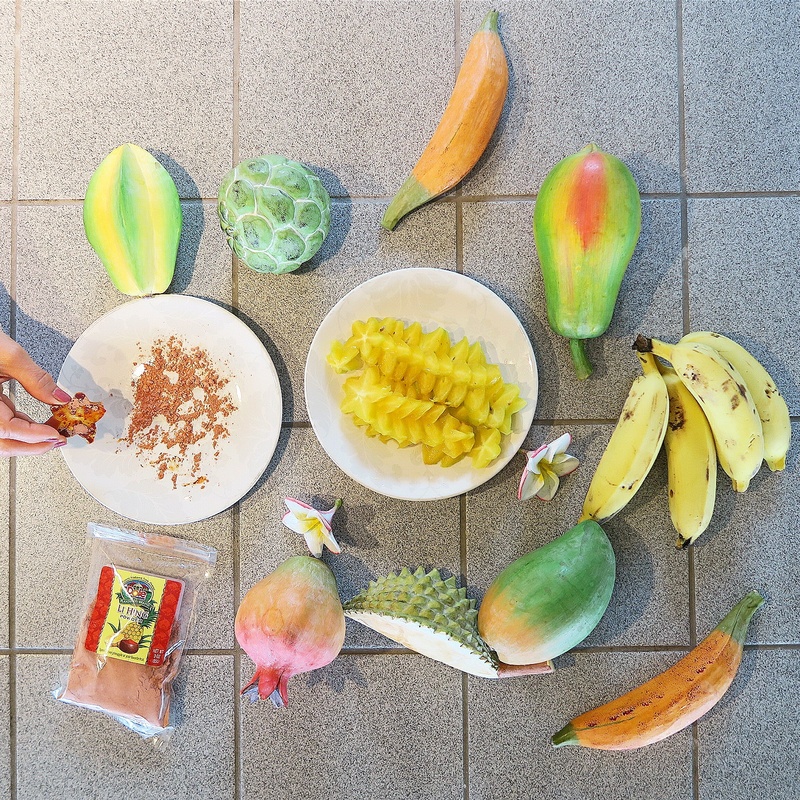 Luckily, right next to Mr. Chow's on the last full day in Maui, Ono Organic Farms fruit stand opened and we were able try a few fruits (both familiar and unfamiliar) to us and they were a definite treat, especially the Sweetsop and Abiu! The broken purple fruit with round dents is the sweetsop and this was seriously a sweet fruit. It has a slight taste of a cherimoya but way sweeter. The sweet passion fruit with the little black seeds in a yellow liquid was not tart like the purple passion fruits I'm used to seeing. Definitely tasty and not potent in passion fruit flavor. The fruit with the 5 seeds was the only miss in the bunch. I can't remember but it was called but it was so hard to eat-it wasn't even sweet. Perhaps it wasn't ripe. Same with the pink guava - not sweet enough for my liking. 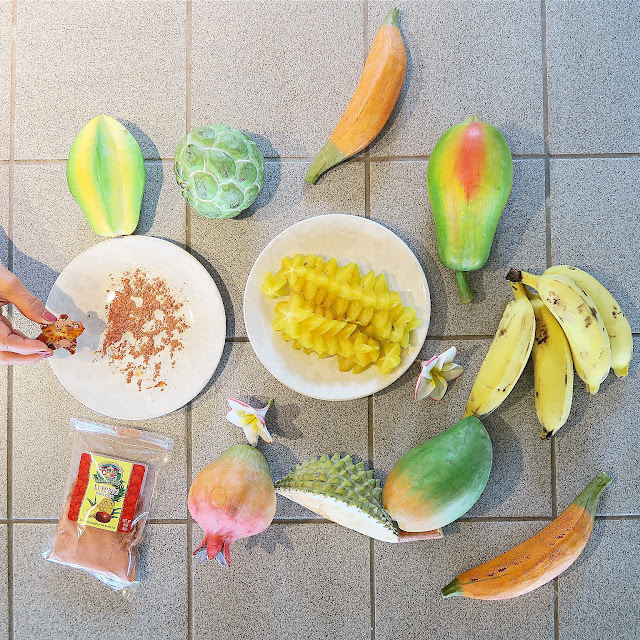 I'll end today's post with a fake fruit + real fruit flatlay and of course some Li Hing powder that is so popular in Hawaii that they basically pair it and top it off on everything. I hope you enjoyed the Hana part of my Hawaii food diaries and hopefully if anyone is heading to Maui and reading this, you get to try some of these places out! Look out for part 4 coming soon!